I’m generally not a Dan Yaccarino fan. Nothing wrong with the man or artist, but his work is not my cup of tea. Until now. I just received his new book, The Fantastic Undersea Life of Jacques Cousteau from Random House. I was working hard to go into the book with an open mind, but found that I didn’t need to go any further than the title page to fall in love. I was looking at a different Yaccarino than I knew, and I LIKED IT! The title page is a two-page spread set under the sea with light blues and soft greens in waves, topped by a series of growing soft yellow bubbles emanating from the breathing equipment of a small dark blue figure swimming under the title. Lovely. But the next two-page spread is even better. There the man is in the foreground against the waves of now soft greens and oranges and surrounded by seaweed, fish, and light. Gorgeous! 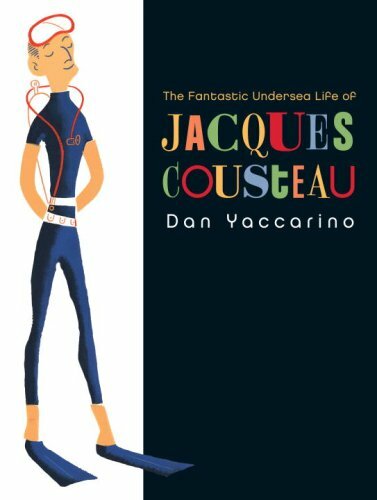 When the subject, Jacques Cousteau, is out of the water, the illustrations resemble the more typical Yaccarino style of sharp contrasts and edges. When Cousteau is shown in the water, the pictures become magical, with those edges softened, the palette less contrasted, and the whole page filled with an undersea world. Each spread features a quote from Cousteau that accentuates the picture and the text. Sometimes we are lucky enough to know that our lives have been changed. It happened to me that summer’s day when my eyes opened to the world beneath the surface of the sea. The book goes on to talk about Cousteau’s advancements in diving gear and underwater filming equipment. It features his adventures in the sea and his commitment to show and protect the world’s oceans. The end of the book lists some of the important events in his life, and gives the resources used for more information. To sum up all this gushing, I completely recommend The Fantastic Undersea Life of Jacques Cousteau. It’s perfect for school and public libraries, and also for the home libraries of ocean lovers and art aficionados. Today’s Nonfiction Monday round-up is hosted at L.L. Owens. Thanks! You just chose Z's Easter basket book for me. He will love this.